We love seeing ugly ducklings turned into graceful swans. After all, anyone can make a Ducati SportClassic look good—but a cheap 1980s commuter bike is a completely different ball game. 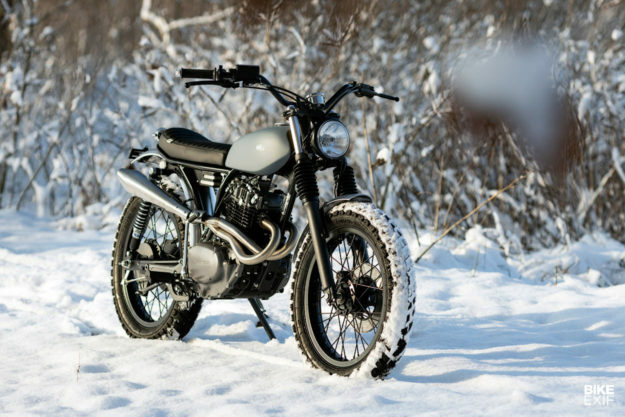 This ice-cool little scrambler started life as a Honda CB250 RS, a plasticky but well-made runabout that was popular in the UK and Europe. 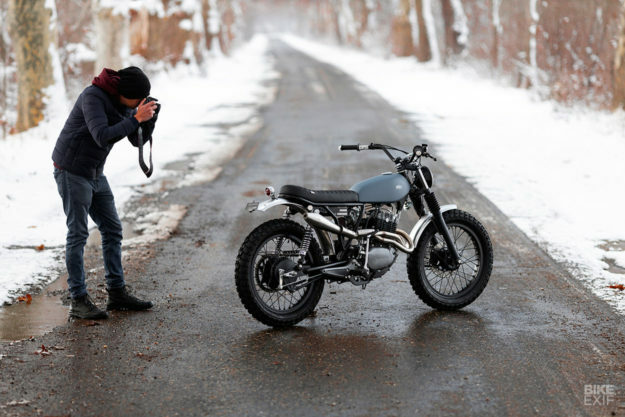 You can still find them on the secondhand market, and they’re a bargain at about US$1,500. 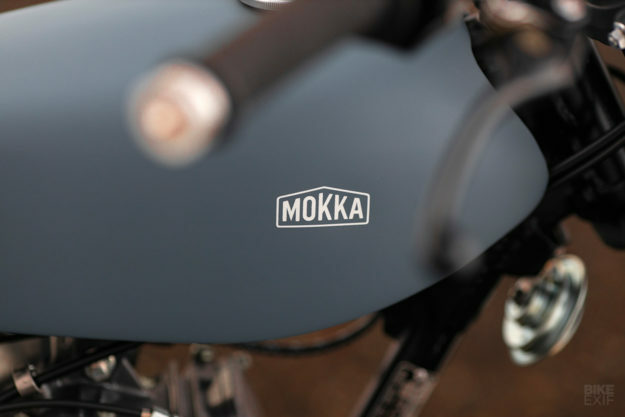 That makes the air-cooled single perfect for a low-cost, big-value custom job—and Mokka Cycles have taken the bait. Mokka is the nom de plume of Árpi Bozi, a young programmer from Hungary. 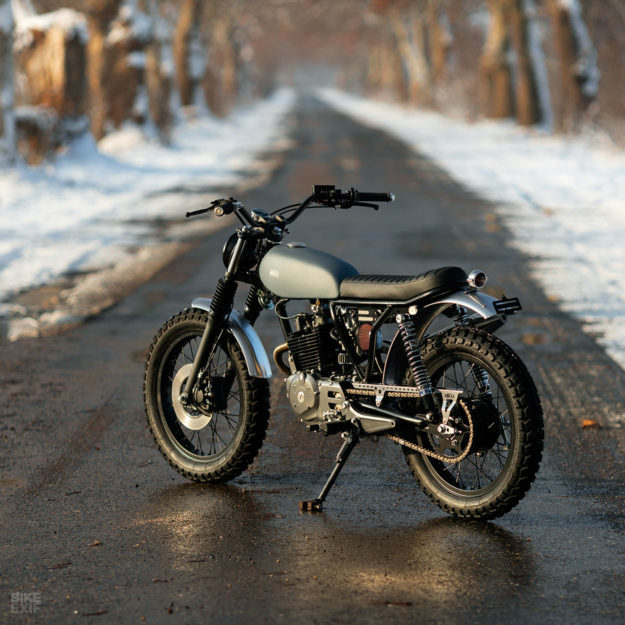 For the past five years, he’s sought refuge from the digital world by building beautifully finished customs. 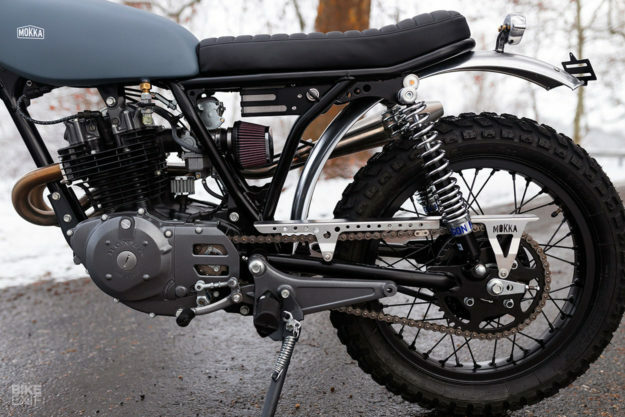 A CB250RS only weighs around 148 kg wet (326 pounds), and the suspension and brakes are excellent. So it’s nimble enough for trails and green lanes. The cosmetic surgery has been drastic, though. Árpi started by binning all the plastics, and then positioning a 1970s-era Suzuki TS185 gas tank on the frame. It’s been tunneled to make it fit neatly. The engine is a ripe 37 years old, so Árpi has rebuilt it back to factory specs using genuine Honda parts. 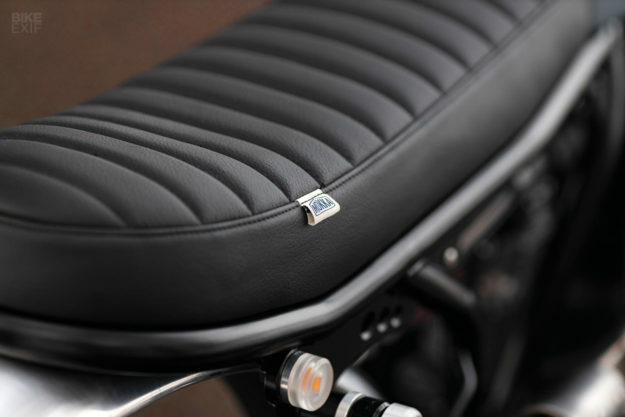 (It’s essentially the same engine as found in the XL250.) 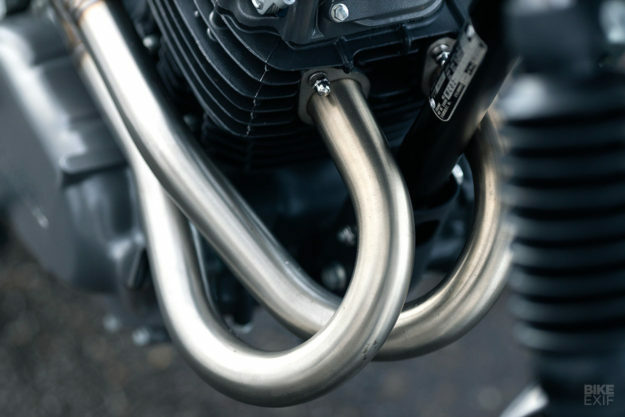 The twin exhaust outlets are now hooked up to a new stainless steel exhaust system with beautifully curved headers that remind us of Auto Fabrica’s work. The pipes are terminated with a simple reverse cone muffler and at the intake end, there’s a K&#038;N filter to free up the breathing even more. Árpi has made the fenders from scratch using aluminum cut and shaped to size, and fitted using custom stainless steel brackets. 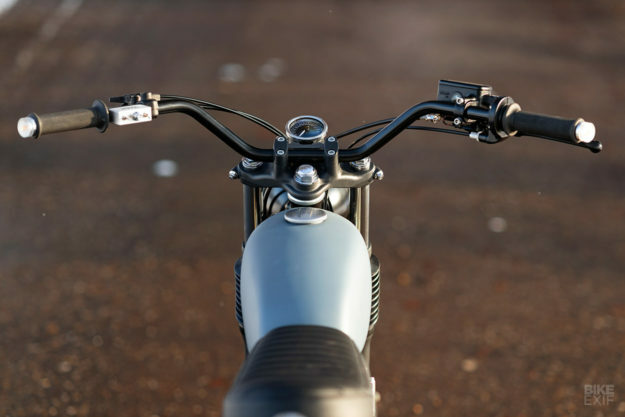 (“Every project is partly about losing weight,” he says, “so there are lots of aluminum parts.”) There’s also a custom chain guard to keep things even cleaner. The speedo is a simple Daytona Velona unit, and the headlight is a classic Bates reproduction. 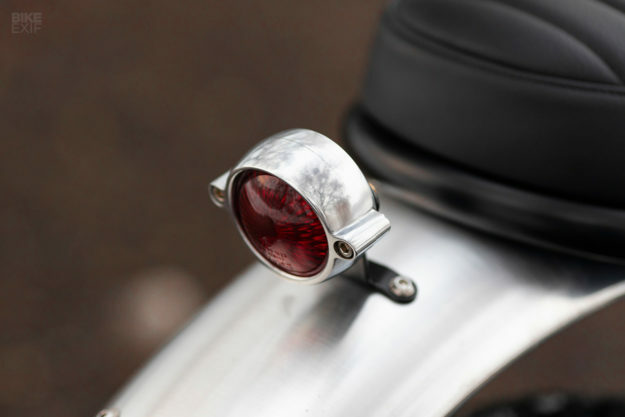 Árpi’s even added a custom-made stoplight, with a cast and polished aluminum shell housing an LED bulb. A lithium battery provides the juice and the little Honda has been completely rewired for reliability. 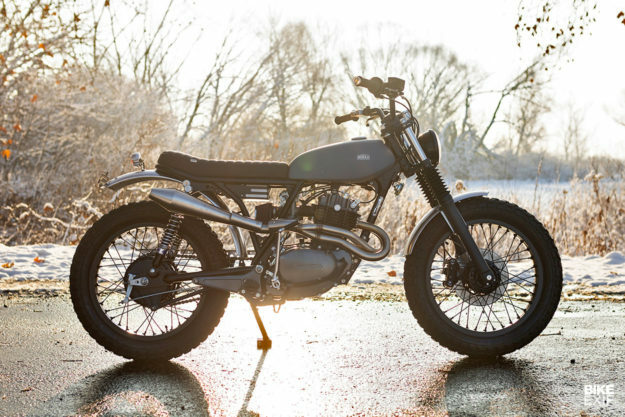 With a fresh set of Heidenau K60 tires installed, the CB250 RS was ready for delivery to its new owner in Denmark, some 1,300 kilometers north of Mokka’s Budapest workshop. What a perfect Christmas present. Now that’s pretty cool actually.